"It would be in the wake of divergencies between the monks and the inhabitants of Vimoutiers that Vimonasteriens would have constrained the monks to build a distinct church named Notre-Dame, Church of Our-Lady. In a bull of the pope Eugene III in 1147, this first Eglise Notre-Dame, is quoted under the name of Eglise Sainte-Marie in Vimonasterium. The church is located on the market place. 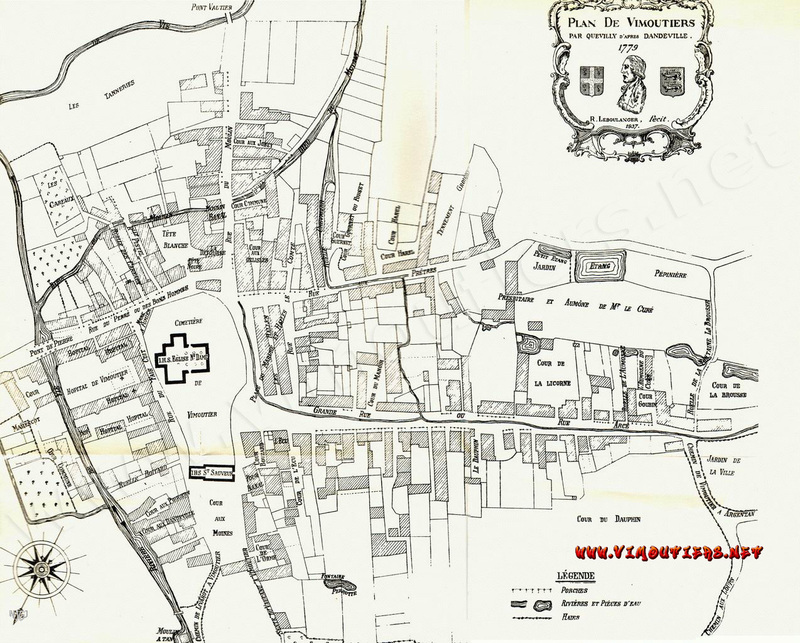 Burned in 1450 during the fights by Dunois to drive the English conquerors out of Normandy, l'Eglise Notre-Dame is finally rebuilt in 1458 on its own ruins (map1779), then enlarged from 1788 to 1790 with the materials coming from the demolition of l'Eglise Saint Sauveur. Then, two sacristies are added, one in the Southern part of the church in 1808, the other in the northern part in 1822. Hence, the church of Notre-Dame is composed of its nave, two collaterals and a transept including on each side the chapel of the Rosary and the chapel of Saint Roch, a previous chapel of Ducy founded in 1619 had been removed when the Church was enlarged and another chapel Sainte Marguerite modified. In the same time, the cemetery which surrounds the church is moved and later on in 1842, a new presbitery is rebuilt in the yard known as "cour de l'aumône", ie yard of alms. 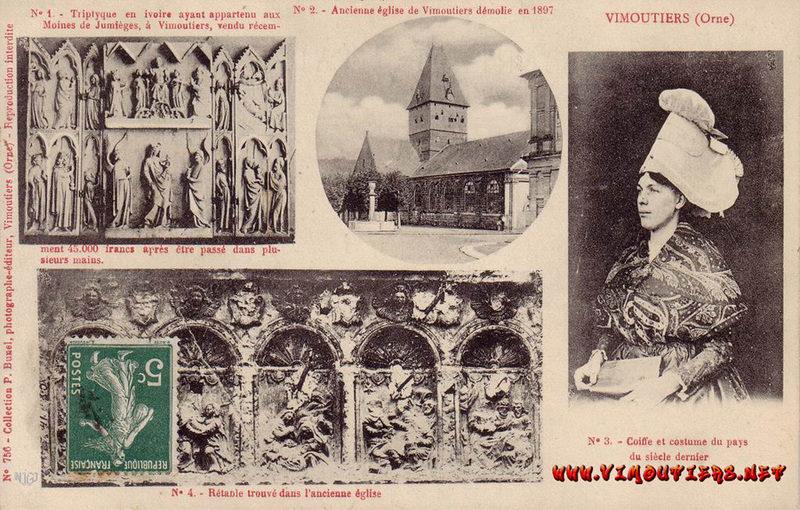 But in those days, Vimoutiers is very prosperous due to the trade of fabrics and the church is said to be too small. In 1866, Mr Abbe Jenvrin, abbot, assisted by the Town Hall members and the parish, call upon a subscription for the construction of a new church. Collecting the necessary funds will take almost 20 years and the first Church of Notre-Dame will survive until 1897, when at 439 years old, it is demolished and sold out for its mere building material value. 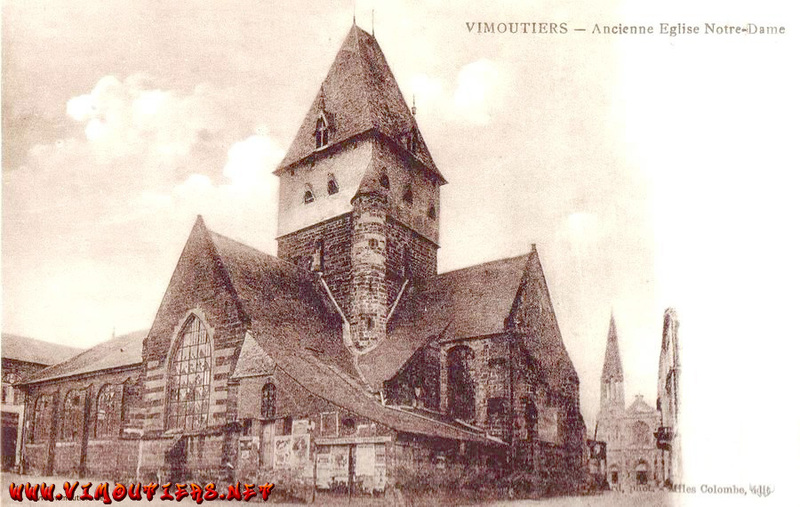 Thus the first Eglise Notre-Dame and the then-completed second Eglise Notre-Dame, will have coexisted for two brief years on the place of Vimoutiers. Florentin Loriot, a Norman poet, composed a pretty testimony for this : About two Notre-Dame on the market place of Vimoutiers. During the demolition, under a pillar a treasure is found, composed of 22 gold coins including 12 with the coat of arms of Charles VI of France, aka Charles VI The Well-Beloved, or The Mad and Charles VII the Victorious, aka the Well-Served, father and son, Kings of France from 1380 to 1461, and 10 at the coat of arms of Henry VI of England King from 1422 to 1471, as well as sarcophagi dated XIIIth century, with their "occupants in good state (!)" some of them surrounded with objects made of copper from the Merovingian Time. - An altarpiece, a retable, dated from the XVIth century, found at the back of the choir behind a 1807 carved group, and exhibited at the Baron Mackau museum in the Hotellerie des Moines de Jumieges in Vimoutiers. Listed as "not protected as Historical Monuments", carved stone made, dimension 100x230, representing episodes of Blessed Virgin Mary's life. This altarpiece and the Hotellerie will be destroyed by the bombardments of June 1944. - Protected as Historical Monument in 1909 :an altarpiece, a retable, from the XVIth century, made of carved stone, dimension 100x230, the description of which indicates a subfoundation supporting six pilasters between which niches with decorated shells represent episodes of Blessed Virgin Mary's life : The Annunciation, The Visitation, The Nativity, The adoration of the Magi and the Circumcision. Are these two retables an only one ? - Also destroyed in 1944, there were 2 golden wooden candlesticks dated end of the XVIIth century. - Two terracotta statues, Saint Dominique and Sainte Catherine of Siena, probably part of a group representing the donation of the Rosary, previously in the chapel of the Rosary."